For many Wabash men, something about Wabash College keeps them coming back throughout their lives. For Dr. Timothy Sipe ‘78, a college-owned 180-acre section of woods on Sugar Creek named Allee Memorial Forest has called him back to the College for decades. 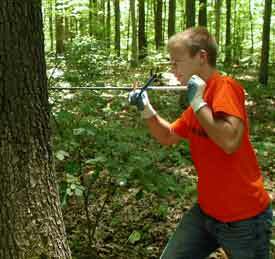 Dr. Sipe has returned to Wabash for the second straight summer to conduct research in the Allee Forest. Franklin and Marshall College junior Robert Yamulla and Wabash sophomore Jackson Schroeder are interning alongside Dr. Sipe this summer. The team has been gridding, mapping, measuring, and coring trees in order to learn more about growth rate and the changing dynamic of the trees. They are also quantifying tree sapling populations and measuring light patterns among other goals and projects. 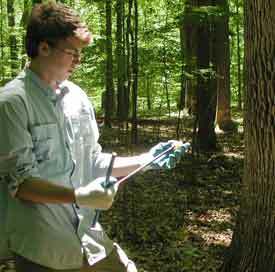 Dr. Sipe has come back every decade since his graduation to study the trees in the woods that introduced him to the type of work he has pursued the rest of his career. Dr. Sipe, who is now a Associate Professor of Biology at Franklin and Marshall College in Lancaster, Pennsylvania, was the first person in his family to attend college and believes Wabash had a tremendous impact on his life. “For me, going to any college would have been a transforming experience, but the luck of going to Wabash and being transformed by the liberal arts education really shaped my world view,” Sipe said. Sipe was interested in the sciences, but did not really get his best experience until between his junior and senior years. That summer was when his advisor, Dr. Robert O. Petty, invited him to do his first research in Allee Forest. Dr. Sipe was contemplating studying forestry, but because of the advice of Dr. Petty, decided to pursue ecology instead. “Having learned from Dr. Petty and other faculty here and having the ability to do one-on-one research with faculty really helped me going on to graduate school,” Dr. Sipe said. Sipe then earned his master’s in ecology at the University of Tennessee. He found himself back in Crawfordsville in the spring of 1982 serving as a visiting professor in the biology department. He realized that spring that teaching was something he enjoyed, and afterwards he pursued his doctoral which he received from Harvard in 1990. Since then, he has spent time researching in Minnesota, Massachusetts, and has taught at Franklin and Marshall since 1997. Looking back, Franklin and Marshall has been a great fit. “Like Wabash, F&M is a highly regarded liberal arts college with a strong commitment to excellence in both teaching and research," Sipe said. Schroeder will finish his work with the project around July 19, and Yamulla and Dr. Sipe will return to Pennsylvania and continue their research in the lab there. Yamulla will be working on this project under the supervision of Dr. Sipe for the next year.